To get fans on Facebook you need to understand that despite all the techniques that other people have tried before, you always have to adapt these tactics to your own page and to your own business. Next, your attitude as a Social Media Manager is very important – you have to be persistent because the base of all success is trial and error. However, there are many tactics and techniques that, having already resulted for other pages, serve as a guide for those who want to conquer a large number of fans on their Facebook page. Paid ads are the quickest and easiest way to make your number of fans grow. However, you need a budget, because the investment will depend on the type of fan page, on the success of each ad and on how much Facebook charges for each “Like”. Therefore, some ad campaigns on Facebook can bring you quicker success towards your goal, but if you want to continue to grow your number of fans without spending money, there are other ways to do it. These other techniques are slower, but reach fans in a more organic way. One of the best starting points to get more fans on a Facebook page is suggesting the page to your friends. To suggest the page, you have to select your personal profile on Facebook as your current status and from there visit the Facebook page you want to suggest. Once you are on that page, you will see a square on the right side with all your friends: all you have to do is select which friends you want to suggest the page to and they will automatically receive an invitation to become a fan. Another easy way to get more fans to your page is by simply inviting everyone on your email list to like the page. 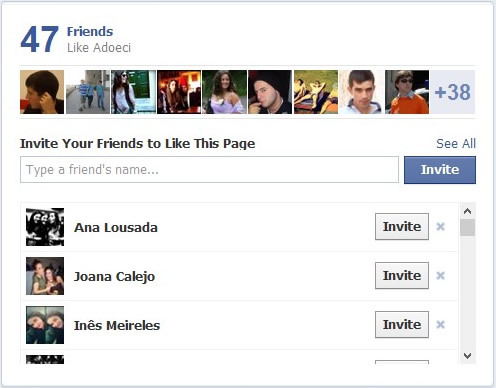 In the option “Build Audience” you can send an invitation to everyone on your email list to like your Facebook page. If a friend or someone you know sends you an invitation, it can attract more attention and curiosity than if it comes from a stranger. Holding a contest on your Facebook page is one of the most effective ways to get more fans and maybe even get more engagement from the fans you already have. A contest will surely boost the page because fans that interact with the page will consequently expose it to their friends who, in turn, will view this interaction on their newsfeed. This is a commonly successful action: all you have to do is provide an attractive prize that matches the interests of your page and your target audience. However, to hold a contest on Facebook, you need to be informed about the rules of Facebook Contests, as well as the update of these rules. Although there are a lot of contests running on Facebook that are not following these rules, be aware that by not complying with these rules, you risk having your page blocked. You can always be inspired by other contests that you see on Facebook, but always follow the rules. If you would like to know more about how to get more fans on your Facebook page through contests, you can read this article on Jon Loomer’s Blog. Placing a tag with your friends’ names or with the names of people that are somehow related to your page on a photo or video – for example, the name of someone who was at an event or somehow interacted with the page – is a good way for your page to appear on their profile pages, as well as on their friends’ news feeds. Besides exposing the page to the people you tagged, as well as their friends, you will be informing them about your existence, which can lead to a bunch of new “likes” on your page. One of the best outcomes of this tactic is that the people identified in the tags like the page so much that they suggest it to their friends, and that’s why you should give the highest importance to the relevance and coherence of the content you choose to publish. In case you already have a blog or website for this page, placing a Facebook like box on it is one of the best ways to get more people to become a fan of your page. By incorporating this box, everyone who visits your website/blog can have direct access to your Facebook page and become a fan directly through the website/blog. This is an easy and segmented way to make your page grow. Seeing as visitors are already interested in the website’s subjects, they will most likely be interested in the content posted on your Facebook page. With a segmented target-audience, it is easier to build a page with good engagement, as well as one that will be easy to interact with. People that are interested in the page’s posts, will surely enjoy receiving your content on their newsfeed. Cross promoting consists in sharing your Facebook page on other social networks where you are also present. If you already have an account on other social networks, like YouTube or Twitter for example, you can share your Facebook page, as well as its content, on those other networks. This is a great way to introduce your page to a larger number of fans, because you will be spreading the existence of your Facebook page on the Internet in an authorized and segmented way (without being considered SPAM). Today, there is a huge amount of information online, so people have to filter what they really want to read and where they want to spend their time. Therefore, to attract people’s attention you have to write amazing content, that people will want to comment and share. Include a call to action, asking your fans’ opinion, share lists and “how to” articles, appeal to their emotions, inciting them to share your content, as well as publishing infograms and creative images – these can all be good choices when it comes to creating great content. Cross posting can be a great way to attract more fans to your page. If you happen to have more pages on Facebook, you can share content from one page on another, promoting them simultaneously, as long as it makes sense. If you don’t have any other Facebook pages, you can propose a partnership with similar pages, inquiring if they are interested in cross posting, where they share your page and its contents and you share theirs. Another way to do this, which is also very common, consists in placing your page’s link in the comments on other pages with the same subjects as your own, but be careful because these actions may be considered SPAM. Introducing your page to everyone that interacts with your project is a good way to increase your number of fans. If you have a blog or a website, you should place the Facebook page’s link on your newsletter, as well as in your email signature, business card, brochures and on any and all merchandise associated to the project. In order for this to be a more effective technique, you should have a customized Facebook page URL comprised of the project or website’s name or something connected to it. For example: https://www.facebook.com/StylishWeddingIdeascom corresponds to the name of the website – stylishweddingideas.com. In order for your fans to keep you in their memory, you should publish at least one post per day and increase the number of daily posts based on the type of page you have. There are pages where it makes sense to have a larger number of daily posts, such as newspapers, because they agglomerate information and their role is to inform. However, there are other projects where it is better to have a smaller number of posts, otherwise you risk becoming a boring and non-desirable page. It is important that the posts are relevant and offer value to the people who will see them on their newsfeed, otherwise, besides not receiving interaction from the fans, those posts can drive them in the opposite way so, instead of gaining new fans, you start losing the ones you already have. Finally, it is important to constantly verify what is working and what is not converting into desirable results. It is important to analyze which type of audience you want to attain and start to understand what their interests are. For example, if they are mostly women or men, which country they live in, how old they are, etc. By understanding your fans, you will be able to create better content and it will help you to define the voice that you should assume in order to have a successful page – you certainly won’t use the same language when communicating with people of different ages, for example. It is important to understand the reach of each post and realize which ones have more engagement so that you can publish only the content that works best on your page. You should also identify the times at which your posts generate more interaction. Facebook will show your posts depending on their relevance to your fans and that is why it is so important to generate likes, comments and shares.